If I had to choose one cuisine to eat for the rest of my life, I would immediately opt for Vietnamese food. I spent several winters exploring the country, with time spent in Saigon and Hanoi, in Hue and Danang, and eating as much as I could every second of every day. As a celiac, eating gluten free in Vietnam was not only possible but gloriously easy. Once I learned the ingredients I needed to avoid, I stuck to street food where I could see dishes being made and I explored to my taste buds’ content. 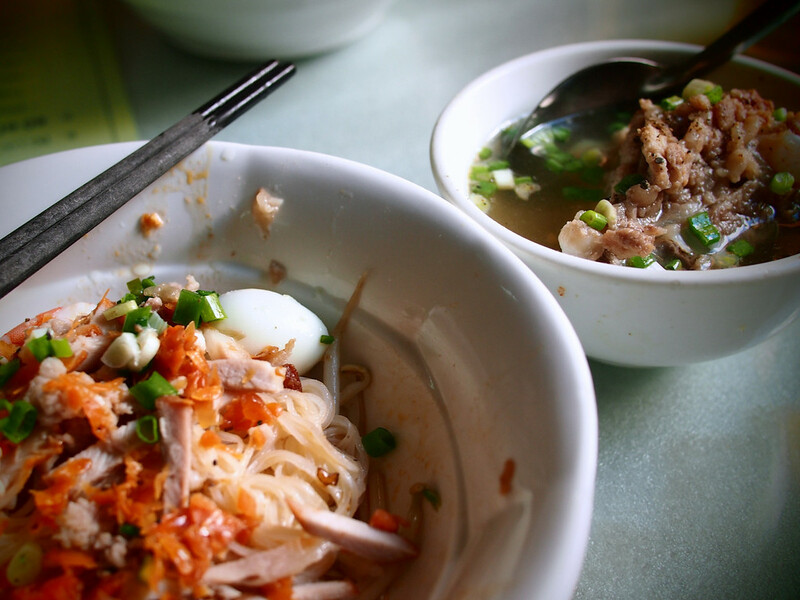 The following guide will help people navigate Vietnam with an eye to avoiding gluten. I am very sensitive and have avoided some dishes at restaurants where oil could be contaminated. The benefit of street food is that often the stalls are one-stop wonders, and if it involves something fried on the spot, the oil is only used for that product. 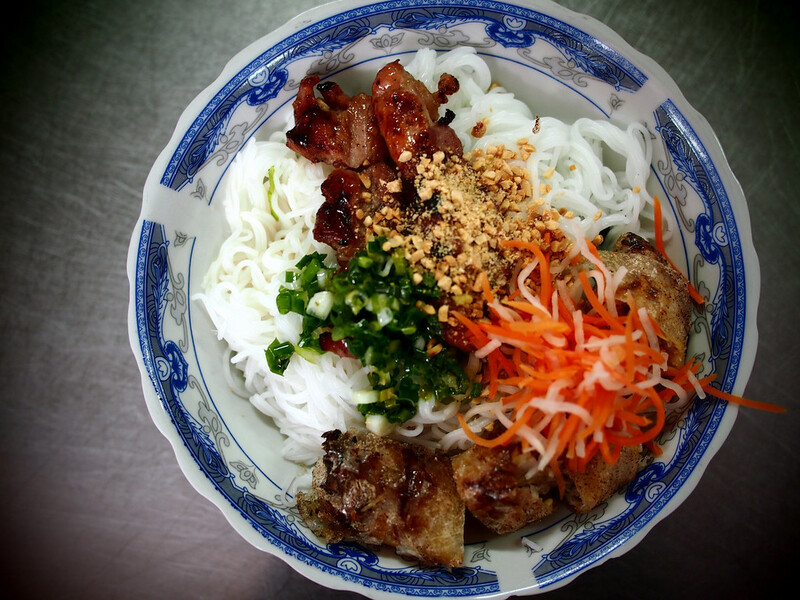 Eating in Vietnam was a pleasure, but also a good part of why I love to write about food. It isn’t just about taste, but the experience of sharing a meal in the midst of chaos, sitting on a blue plastic chair. 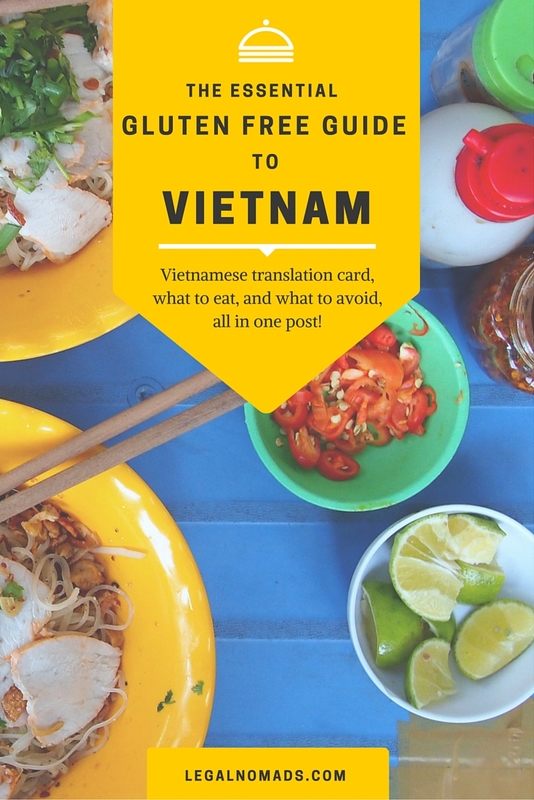 I hope this guide, twinned with my long Saigon Street Food Guide will make your time in Vietnam exciting, delicious, and filled with incredible sights. 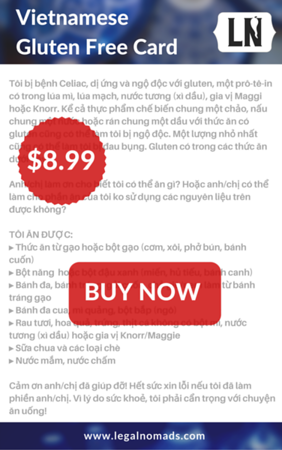 Already know you want a gluten free translation card? You can buy my Vietnamese card here, as well as Italy, Japan, Greece, Spain, and more! What ISN’T safe to eat as a celiac in Vietnam? I was diagnosed as celiac in early 2000s, though I rarely wrote about it when I started Legal Nomads. Honestly, I didn’t think readers would be interested, and it was something I struggled with heavily as I travelled but I kept it to myself. When I met readers, many mentioned they also had celiac disease, so I started making sure I provided tips for celiacs or those following a gluten-free diet. This gluten free Vietnam guide is built with an aim to help fellow celiacs, but also to encourage people to eat in the country — it’s truly some of the best food you’ll try. Saigon was a paradise for celiacs. I have been “glutened” inadvertently in Hanoi, where wheat is used more frequently, but in the South — Saigon and the Mekong — I have not had any trouble. I should note cross-contamination is an issue as I am really sensitive to gluten, but despite this the soy sauce in Southern Vietnam has been fine for me. The soy sauce does not have wheat listed as an ingredient, unlike the ones we find in the West or in China and Japan. Whether that means there is no trace gluten in the sauce remains in question, but I did not get sick when eating soy sauce dishes on the street. There is some contention about soy sauce generally, as some companies have said that fermenting soy sauce removes the gluten. Yes, it’s true that fermenting means that testing antibodies won’t detect hydrolyzed gluten, but the peptide chains remain, and gliadin is still there. Nima Sensor has a whole blog post about it, for those interested. Tourist-driven (read: fancier) restaurants will import wheat-y soy sauce from elsewhere, so my solution was to eat everything streetside, with great success. This card was the second in what has become a series of gluten free guides and local language cards, and I’m excited to be working with translators and celiacs to build detailed and safe cards for us to use on the road.Each of the cards in the guide has been created with celiac-specific research, mention of cross contamination, and double checked translation from locals who speak the language. Note: The card is available for purchase via trustworthy 3rd party site that uses https, so you know your information is safe. I am not gathering emails or information for anyone who buys the card. I have used several different translation cards on my travels, and still got sick. I may be more sensitive than some celiacs, but even a small amount of contaminated oil for frying, or soy sauce in the food, is enough to make me ill for days. Let alone the joint pain later that week! This card is different because it not only uses all of the local food names for what to eat or avoid, but makes clear mention of the cross contamination concerns. A big thanks to To Tra for enlisting her entire family’s translation services in an aim to make this card as thorough as possible without overwhelming waitstaff. 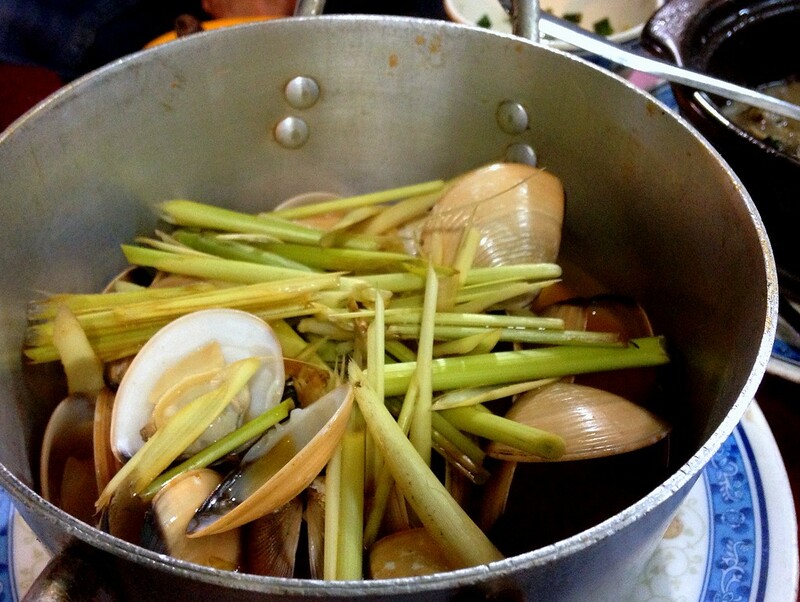 Before I went to Vietnam, my familiarity with the cuisine was quite shallow. Even now, after years of time in Saigon, I am likely missing some of the great dishes in my repertoire. One of the most rewarding things about Vietnam travel is how excited people are to share their food with you. As a celiac, the best weapon against anxiety from the disease is an understanding of the building blocks that go into each dish. Vietnam makes this easy for you. One of the most helpful aspects of Vietnamese eating is that the dish names are profoundly descriptive. What we in the west call pho is not only a soup name, it refers to the noodle used in the soup. Same for many other dishes, such as the litany of bun or banh dishes, referring to the starch that defines them from other dishes. Please see my VERY long food guide to Saigon Street food for photos and a more thorough description of each of the dishes below — this should be read alongside the current gluten free Vietnam guide to provide you with the most thorough information prior to your visit. Condiments — the plum or hoisin sauce with pho, for example — ought to be chosen quite carefully, but the most common condiment of all, fish sauce, was gloriously gluten free. Thankfully I did not suffer adverse reactions to fish sauce during my winters of eating in Vietnam, but it is worth mentioning in the event it becomes more common. Fish sauce aplenty, to stay or to go. For banh xeo and banh khot, please be sure to ask if their batter has wheat and rice flour. The recipe is meant to be made with rice flour but some places are using pre-made mixes, in which case it is not safe for celiacs. goi cuon – fresh spring rolls, which are wrapped in rice paper. Often called summer rolls in North America. mi quang – the exception to the “mi / my” category below, mi quang noodles are actually made of rice, served with a smaller amount of broth that is tinted with turmeric. They are wider than pho noodles and quite delicious! mien (mung beans) noodles. Mien noodles can often be found in stalls that sell pho, and one of my favourite dishes to get when I had a cold was mien ga, chicken noodle soup with mung beans as the noodle base. pho (rice) – while we often use pho as the name of the soup, the soup’s name comes from the noodle itself, which is made from rice flour. Bun noodles are made from rice and are gluten free. cha gio (fried spring rolls, wrapped in rice paper) Northern style restaurants will call these nem. Note that for celiacs eating in Hanoi, they are not always made with rice paper as the wrapper, as they are in the South. 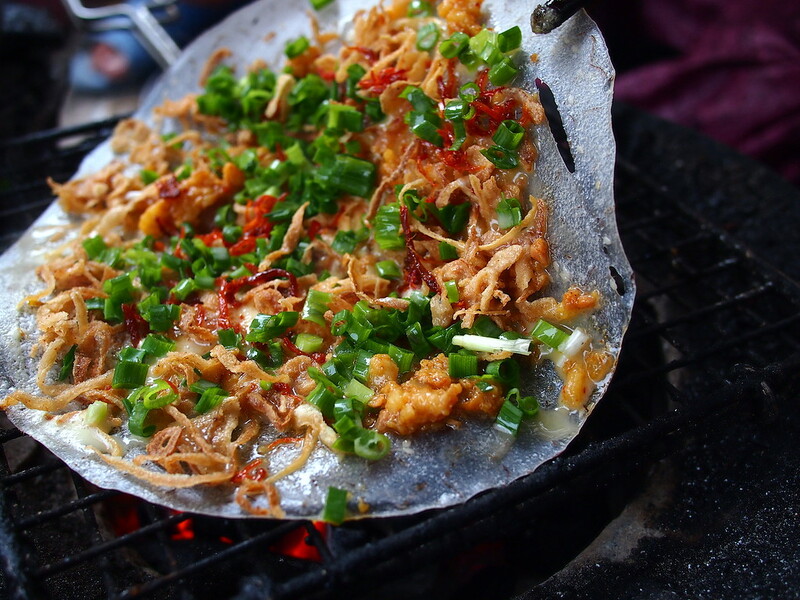 Northern nem are sometimes dipped in bread crumbs before being fried, so again please be cautious if not in Saigon. com (rice) – com tam (broken rice), com suon (rice with pork chop), com hen (rice with baby clams) — com anything, really. chao long – this is a congee-like porridge, made with rice and some deliciously nutritious offal like lungs and intestines, as well as blood cubes. It’s not for everyone, but it is amazing if you enjoy your grisly parts. Note that they usually come with bread on the side, or chopped inside, but you can just decline them. oc – snails, but an oc restaurant will not only serve snails but also a dizzying variety of delicious seafood, from grilled scallops to lemongrass clams, and so much more. Often these are cooked over the fire or steamed, and I did not encounter breaded options very often. Unlike the fried oysters or breaded scallops of Canada, I was able to partake in almost all of the seafood at these stalls, and it was incredibly tasty. For a primer, please see Vietnam Coracle’s Snails and Seafood guide. I would be remiss if I didn’t mention the snacks. One of the hardest parts about being a celiac is that often the “on the go” snacks that countries offer are made from wheat. It makes sense; the sandwich or pastry are both easy ways to transport food without making a mess. With the exception of Mexico, where corn snacks are everywhere, I’ve had a hard time with mid-meal noshes. Not so in Vietnam! From banh trang nuong (grilled rice paper rolls), below, to banh trang tron (rice paper shredded and mixed with quail egg, peanuts, chili oil, and green mango into a salad), to banh trang cuon (rice paper rolls with similar ingredients but rolled and cut into a bag), I never felt hungry when soups were lacking. None of these had any wheat. Several readers report that the Four Seasons Nam Hai in Hoi An can also accommodate you fully as a celiac. Given my travels are usually slow-travel, long term wandering, I didn’t test this one out but it is in line with other Four Seasons properties around the world. For that price, I’d hope so! For a gluten free hotels in Hanoi, La Siesta Trendy is a reader fave, located on Nguyen Quang Bich Street west of the Old Quarter, with the chef preparing special breakfast treats. Similarly, La Siesta Hoi An prepared gluten free bread and food that was safe for celiac readers. For shops, most of the gluten free products I bought were from L’Annam Gourmet, which has stores around the country. What ISN’T safe as a celiac in Vietnam? This list is blissfully shorter than many countries out there, but is worth memorizing the names – nui, my, won ton – so that when you see it on menus you know what to avoid. The Vietnamese card also has these foods to avoid. hu tieu won ton (won ton soup with egg noodles) – however, hu tieu Nam Vang is fine as it is made with tapioca noodles. fish or meat that is deep fried, as they are often dredged in flour first. 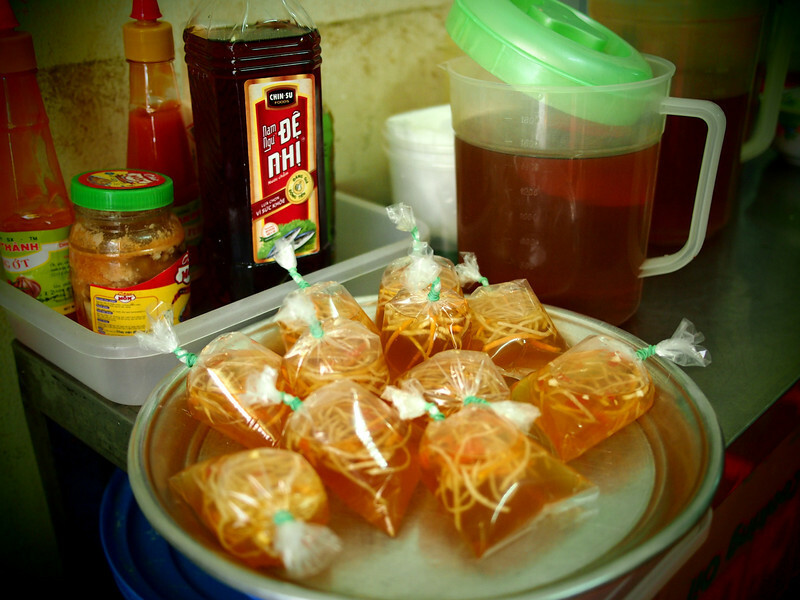 nem / cha gio in the North: the north of Vietnam does use more soy sauce from China, which has wheat, and will also use wrappers that are wheat-based instead of made from rice. You must double confirm that your food in Hanoi and the north is 100% gluten free. Namely: no soy sauce, that the wrappers are made from rice if you are eating in and around Hanoi, and that no wheat was used to make the nem. marinated meats are in the “ask” category: worth asking if soy sauce was used to marinade. It’s worth mentioning that most of the soy sauces I saw in Southern Vietnam did not have wheat in the ingredients. Soy is often used to marinate grilled meats used in bun bowls, though the bowl above is from Saigon and the soy sauce used did not have wheat as an ingredient. The restaurant was surprised when I was thrilled to read the bottle! I did not yet have a GF card to show them. Mexican restaurants get a “pass” in many Vietnamese gluten free guides: in my experiences this is RARELY the case. Among the issues I’ve found: tortillas that are half wheat, half corn (found this one out the hard way), wheat tostadas, contaminated fryers, and more. Koki flour: used more in Thailand than in Vietnam, but it’s a batter that includes flours like wheat. A no-go. Really, other than the cha gio etc in the North, I’d avoid deep fried stuff in Asia. For those of you looking to visit Vietnam, there are some wonderful books to help inform your visit. 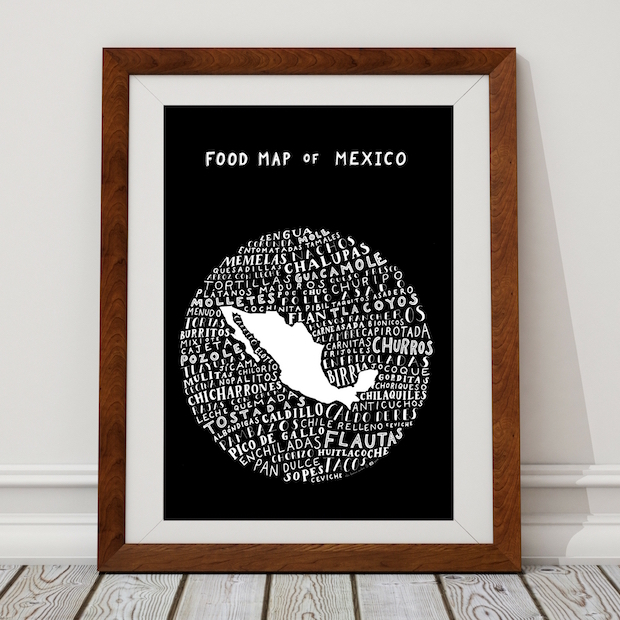 The country is a complicated one, with a history that includes war and migration of citizens and a deep love of food. Catfish and Mandala: A Two-Wheeled Voyage Through the Landscape and Memory of Vietnam, by Andrew X. Pham (One of the first books I read that featured Vietnam, and I’ve reread it in the years since. Highly recommended). The Quiet American, by Graham Greene. Fire in the Lake, by Frances Fitzgerald. Asia’s Cauldron: The South China Sea and the End of a Stable Pacific, by Robert Kaplan. Into the Vietnamese Kitchen, by Andrea Nguyen. For those who can eat bread (i.e. not celiacs like me), Andrea also has a cookbook about banh mi that was just published. For the rest of my celiac translation cards and guides, see here.